Man I hate that word!!! 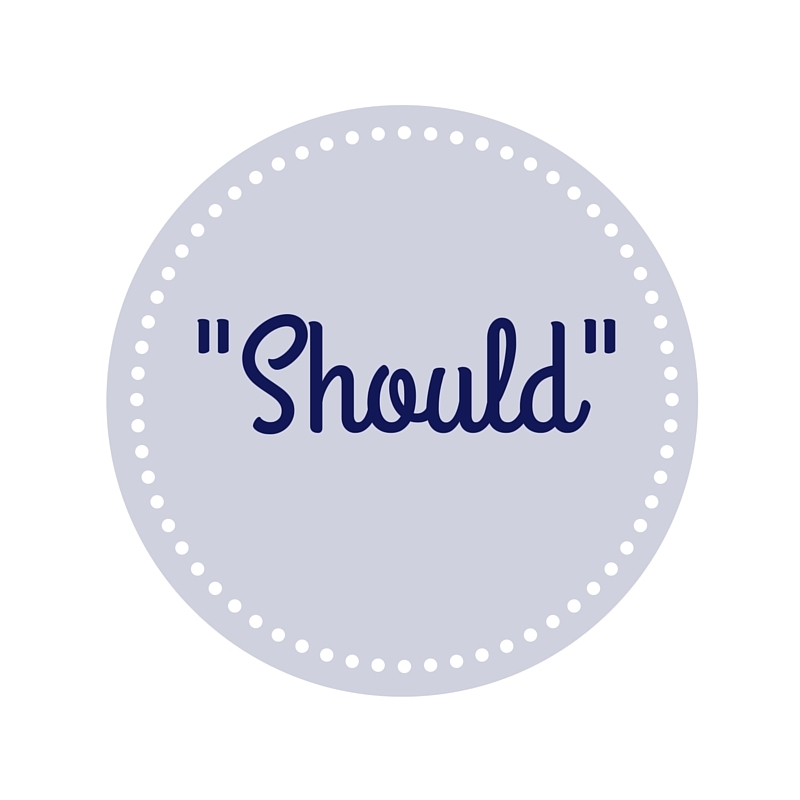 “You should”, “I should”, “the baby should”. That last one killed me on the daily. “Your baby should feed every 3-4 hours” – tell that to a mother whose baby cries for hours on end and wants to comfort feed all afternoon! “Your baby should be awake for an hour and then sleep for 2-3 hours” – Don’t even start with me on this one!!! Tell that to a mother whose baby cat naps all day long. “Your baby should put on X amount of weight every week” – As if a mother can absolutely control that down to the gram! Ok, I absolutely GET that these things are all approximations around normal behaviour that a baby might naturally exhibit, but these “should’s” are just disheartening to many new mothers. Especially those blessed mothers (like me) who had an entirely opposite experience to what “should” have been happening. Feeling like my baby was not doing what she “should” have been doing made me feel like a total failure as a mother and secretly I cursed my life for having (what I perceived was) a “difficult” baby. From week five, baby Mackenzie woke up to the world. In a literal and figurative sense!! Almost overnight she was hard to settle, cat napped, screamed for (what seemed to be) unknown reasons and cluster fed like a demon in the afternoons. When we’d finally get her down to sleep at night she’d wake on and off for another 2-3 hours before finally doing some longer stretches of sleep, and then feeding 2-3 times in the early hours of the morning. I was exhausted and staring down an irrational black hole thinking that she was going to be like this forever! “hmmmmm” she said, “this is actually normal behaviour for her adjusted age”. She explained that her behaviour was normal for a 7 week old – which if she was born on time would have been her current age. Then she explained something about how a baby’s neurological age is determined by their due date, not their birth date. Some experts disagree with adjusting an overdue baby’s age (most agree on adjusting a premmie baby’s age) but hey, it sounded right to me at the time and actually – to be told that what she was doing was normal was such a weight off my shoulders. It wasn’t me after all! And I didn’t have a difficult baby either (which I would learn was absolutely true a few months later), my daughter needed me and when I responded to her, how reassuring it was to be told that I was doing everything that she needed from me at that moment. She advised to stop listening to the “should” army and their unrealistic framework, keep feeding on demand when she woke, turn off all distractions and to really learn my baby. Learn what her tired signs are and I’d then learn when to put her to bed. Then let her dictate the routine. Finally, she gave me that annoying line that “it’ll get better and she’ll learn to sleep longer”… It sounded like I was doomed to be exhausted forever but of course she did get better, and does sleep longer now. Accepting that your baby is not doing what they “should” be doing doesn’t mean you can’t do something about it. If your baby’s behaviour leaves you feeling overwhelmed, tearful or unable to cope – reach out. Try some sleep techniques (we did, but that’s a story for another time), ring a friend or family member to come around and help out or even to have a cry with. As a last resort, put your baby safely down in their cot and go walk around the outside of your house once (or twice, for good measure) before responding to them again. Do what you need to do for you to be the best parent you can be. For me, just being told that my baby was normal was enough for me to push forward and keep going. So ugh to the word “should”! When your baby wakes, go to them, respond with your touch and your voice, feed them, interact, check she’s clean, warm and dry, read her face and learn her, and enjoy those sweet baby cuddles. It absolutely will get better. It’s about taking the pressure off yourself and baby and then using your instincts. Each day brings new challenges and more importantly, new joys, step back and look for them! I half sobbed the first time I realised Mackenzie was sighing as she fell asleep in my arms, like she was content and felt so safe and cosy. I might have felt bewildered and like a total failure at times, but to her I was safety and calmness. I was hers as much as she was mine. How do you distance yourself from the “should” army? What was the best advice you received to counter the “should” statements?